Catherine Lundoff is a transplanted Brooklynite who lives in scenic Minnesota with her wife, a fabulously talented bookbinder and artist, and two cats who own them. In former lives, she was an archaeologist and a bookstore owner, though not at the same time. These days, she does arcane things with computer software at large companies and hangs out at science fiction conventions. Her recent works include short stories in Callisto, The Cainite Conspiracies, The Mammoth Book of the Adventures of Professor Moriarty, The Mammoth Book of Jack the Ripper Stories, Respectable Horror and Tales of the Unanticipated, and essays in Nightmare Magazine: Queers Destroy Horror Special Issue and SF Signal. Her books include Silver Moon and A Day at the Inn, a Night at the Palace and Other Stories and the Goldie Award-winning collections Crave and Night’s Kiss. 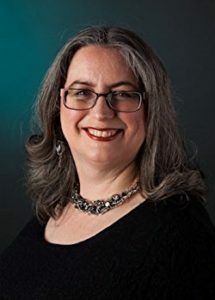 She has also co-edited or edited two anthologies: Hellebore and Rue: Tales of Queer Women and Magic (with JoSelle Vanderhooft) and the Spectrum Award-winning anthology Haunted Hearths and Sapphic Shades: Lesbian Ghost Stories. She teaches writing classes at The Loft Literary Center in Minneapolis and elsewhere.